Also appears in G.T. Emmons "Kitkshan Notes & Writings" p.49. "The two carved poles represent the crests of the Kish-hasht family. The farther one shows two owl figures with numerous children figures. 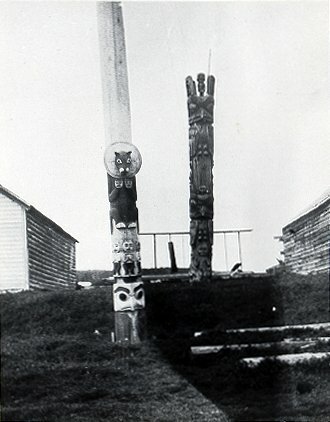 The nearer pole represents the bear that lives in the moon:(the head of the bear is through the full moon) Below are several figures of children that he steals and carries off to the moon. At the base is represented an owl"